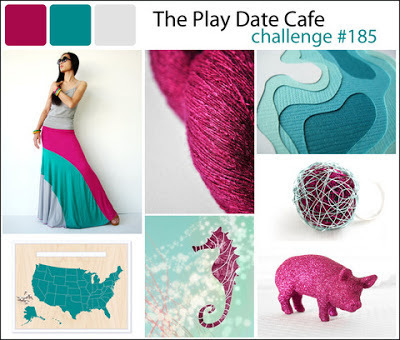 It's that time again - time for a new color challenge at The Play Date Cafe. Our colors this week are Magenta, Teal and Light Gray. 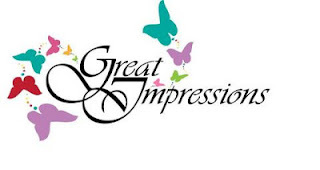 Our sponsor this week is Great Impressions Rubber Stamps and they graciously provided all the design team members with their stamps to use in our projects this week. I love this scene of houses and this sentiment. It's a perfect housewarming card. I colored the houses "loosely" with Copic markers. I added some tiny pearls and magenta rhinestones for accents. One lucky winner will get a FAB prize from Great Impressions. I hope you will join us. These colors are bold and fun. I can't wait to see what you create with these colors this week!! I think I would need sun glasses to live in that neighborhood - lol! Great take on the challenge and who says trees have to be green! 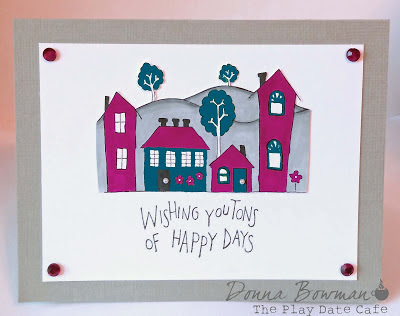 Thanks for showcasing our stamps this week Donna! Cute cute and uber fun Donna, LOVE these colours! Love the little scene! Great use of those beautiful colors! Very pretty Donna. Love the houses and the way you used the colors. The hills and trees look great too.